Congratulations to two of our Stamford Odyssey of the Mind teams, the all-girls team from The Academy of Information, Technology and Engineering (AITE), which took first place with the highest scores of the day, and students from Toquam Elementary School, which earned second place. Both teams advance to the Odyssey of the Mind World Finals, which will be held at Michigan State University in May, where they will compete against more than 800 teams from around the globe. Please consider supporting our accomplished teams with a donation that will fund this special opportunity! 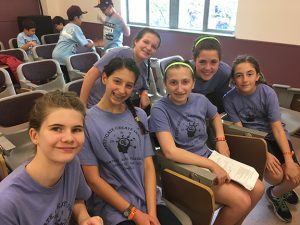 Of course, we are very proud of all of our Stamford teams that competed at the 2019 Connecticut State Odyssey of the Mind Tournament which was held on March 16th. We had 14 Stamford teams competed against 135 teams from across the state. Teams from Davenport Ridge Elementary, Springdale Elementary, Scofield Magnet and Turn of River each took home the third place medals in their respective problems and divisions. 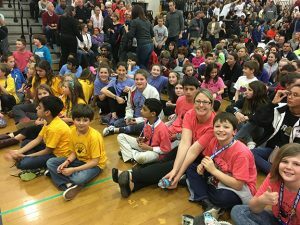 Two Stamford teams, Springdale Elementary and AITE, were awarded the Jill Riggles Award for the highest score in the Spontaneous portion of the competition. Odyssey of the Mind is the largest international creative problem-solving competition worldwide. It is an innovative, extra-curricular learning experience in which school-based teams are tasked with solving problems that range from building mechanical devises to presenting their own theatrical interpretation of literary classics. Driven by discovery and exploratory learning, Odyssey of the Mind teaches 21st Century Skills, is STEAM (Science, Technology, Engineering, Arts and Mathematics) focused and supports current curriculum standards. Learning to solve problems creatively and confidently is an invaluable life skill. Solutions are created 100% by the students on the team. Teams cannot accept outside assistance, even from coaches, teachers, or parents. The Odyssey Experience: Build Self Confidence. Develop Life Skills. Create Lasting Friendships. SPEF’s Odyssey of the Mind teams meet weekly, from October through March, to develop their long-term solution. Specific meeting day and times are determined by individual teams and their coaches. Through interactive activities, mentoring, and competition-based creative problem solving, participants of the program learn peer-to-peer collaboration, leadership, and listening skills. SPEF is always looking for Odyssey of the Mind coaches. Program participation is limited, based on availability of coaches, and therefore parents, community members, or Stamford Public Schools employees are encouraged to particpate in this program. No experience is required, just time, patience, and an appreciation for “outside-the-box” thinking! Training, mentoring and extensive resources are provided.